A group of Pupils raised money for BBC’s Children in Need on Saturday 20th November by doing a sponsored walk from Treorchy Train Station to Tonypandy Co-Op. The pupils raised a massive £204.78 for the Charity. 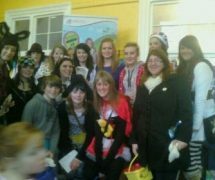 The organizers were two year ten pupils, Jazmin Williams and Emily Wilton. “It was a great thing to do for the charity and we are so pleased to have raised this much money and to have taken part. It’s an amazing charity.” says Emily. 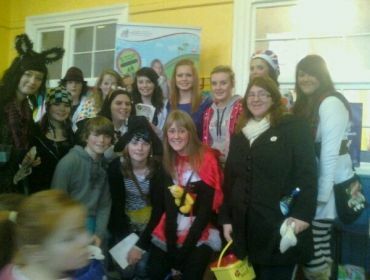 The group were lucky enough to have bumped into Over the Rainbow’s runner up, Sophie Evans, whilst on their travels. I note that the film hasn’t actually been posted…. just saying. Yeah I know. It WAS uploading to Youtube but Moofie’s account got hacked. It’s on Facebook though if you want to watch it. I might ask him to put it up sometime soon since his new account has been offered Youtube partnership. He’s uploading just about anything.